should be able to visually follow an object past the midline, coordinating eye movements with head turning. At 4 months of age, the normal infant can visually follow an object in all directions. Convergence is also present by this time. The presence of optokinetic nystagmus indicates a complete pathway from the retina to the occipital visual cortex. This response can best be elicited in children 3 months of age and older by using a long, striped cloth and passing it rapidly from one side to the other in the child's view. The development of nystagmus as the child attempts to maintain fixation on a stripe is the normal response, indicating normal visual pathways. At 5 to 6 months of age, the child should be able to focus on objects but is farsighted. The child should be able to reach out for an object and grasp it. Recognition of objects and faces by 4 to 6 months of age is suggestive of normal visual acuity. Observe ocular motility in a child 3 months of age or older. Have the child visually follow an object into the various positions of gaze. Alignment of the eyes is best determined by the symmetry of the corneal light reflex and the alternate cover test, which were described in Chapter 10, The Eye. The child is most susceptible to amblyopia within the first 2 years of life, although the risk is present until 6 to 7 years of age. If there is a suspicion of child abuse, examine the retina. Although examination of the retina is not routine in this age group, visualization of the retina may reveal evidence of child abuse. 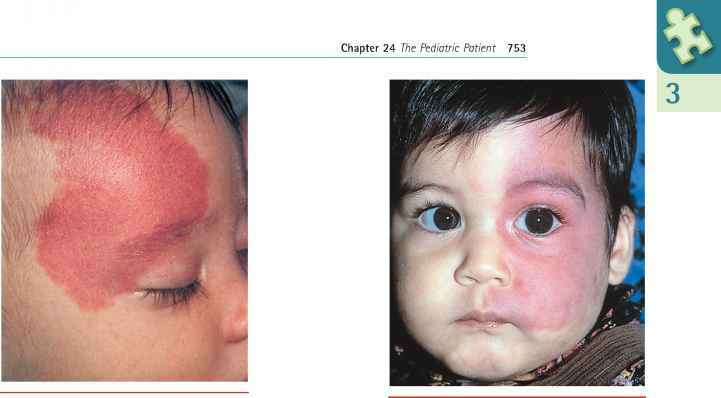 A shaken child may have characteristic retinal hemorrhages, as shown in Figure 24-34. Funduscopy is not useful for detecting papilledema in an infant with an open fontanelle, because an increase in intracranial pressure produces a bulging of the fontanelle, and even separation of the cranial sutures, before papilledema.